Home/CRO/A system to improve website conversion rates? A system is a repeatable process that gives predictable results. Is there a system to improve your website? Can you repeat the same process over and over to get predictable online returns? In this article I’ll explore the processes that inform conversion optimisation, and the concept of ‘repeatability’ when it comes to persuading website visitors to purchase. All systems can be broken down into separate tasks. a) Quantitative data: web analytics (e.g. Google Analytics), Event Analytics (e.g. Heap, MixPanel), Net Promoter Score, system usability scores, form analytics. b) Qualitative data: heatmaps, video replays, user surveys, user testing, customer interviews, eye tracking, mouse tracking, customer service transcripts. Repeatable? Data collection doesn’t always derive from the same source, and hypotheses can be based on one insight or multiple insights. You have to know where to look based on the situation. What should you change next? Three components determine prioritisation: revenue impact, resource/cost and time to market. Google Analytics can determine revenue impact. Resource/cost and time to market are very specific to your individual business. Every business needs its own unique prioritisation system to make this determination. a) Determining revenue impact requires analysis of page-specific conversion rates and ecommerce contribution. b) Determining the duration of an A/B test requires an understanding of statistics (sample size, minimum detectable effect, confidence, etc). c) Determining ‘time to fix’ requires an understanding of development resource, technical complexity and office politics. A conversion pattern is an easily repeatable user interface change that allows you to predict and repeat effects quickly. In other words, it’s copying designs from others because you know it worked before (i.e. there’s a documented winning A/B test result somewhere). Repeatable? By definition, conversion patterns are repeatable. However, the reality is that most design changes are unique to your business. The biggest wins result from your own data-driven UX. 4. A/B test or not? You don’t always need to A/B test. If the insight is black and white (e.g. your shopping cart has a critical technical error! ), then you might just go ahead and make that change without conducting an A/B test. Or you might not have enough traffic to A/B test. Repeatable? Yes. It’s obvious when stuff is broken and needs fixing. It’s also usually pretty clear when traffic is too low to run a statistically viable A/B test. Let’s say you favour Bayesian as a method to evaluate your test results (and you probably should). Without going into the maths, Bayesian evaluation is based on risk vs reward, rather than ‘did we hit 95% confidence’. In other words, Bayesian evaluation involves looking at context to determine when to make a change. Repeatable? A/B test results aren’t black and white. It depends on you risk profile, and you might make decisions on a case by case basis, depending on the risk vs reward of an individual test result. The answer to “should we implement that?” should be debated between stakeholders. 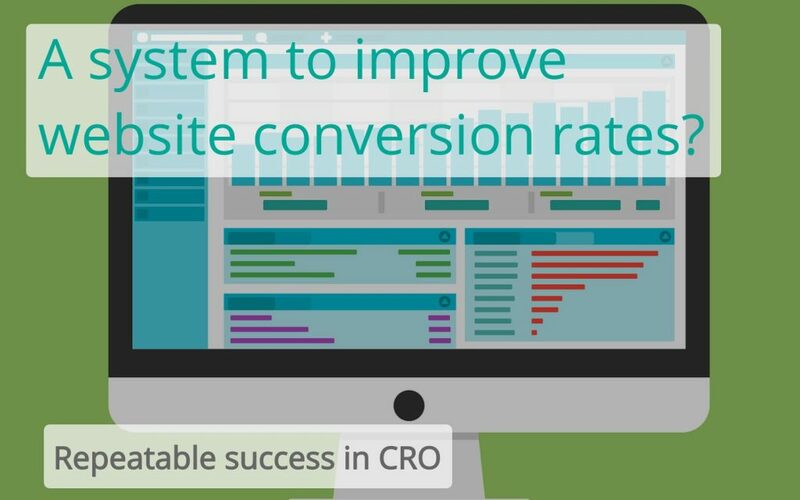 The word ‘system’ reduces conversion optimisation to a linear, step-by-step process. The reality is that website improvement is messy and non-linear. Compartmentalising conversion optimisation into five distinct parts it arbitrary at best. However, it’s a useful exercise for anyone hoping to systematize the process. Use a framework instead. Systems are rigid, frameworks are flexible. With a framework, you follow established principles, but have the freedom to move back and forth (or skip) depending on context. Looking for a way to maximise revenue from your website? True optimisers have a structure approach. Reach me here to discuss the conversion opportunities.